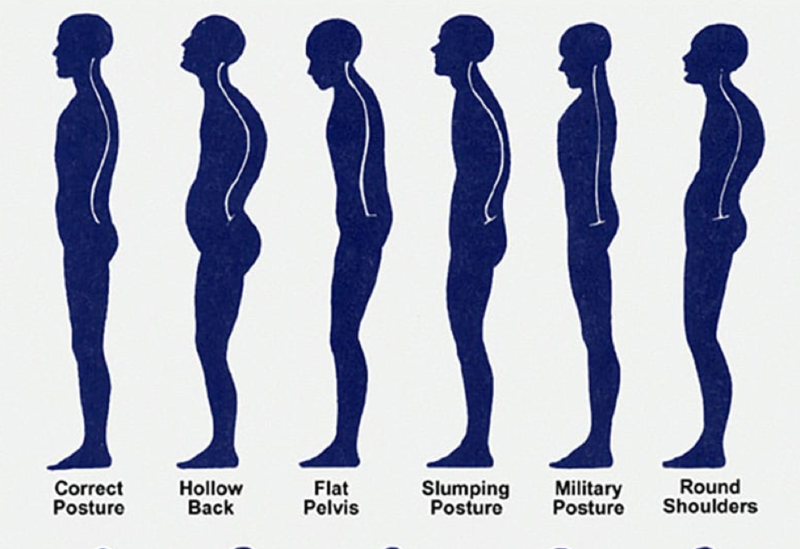 We believe that good health starts with good posture. Whether you are sitting, standing or lying down, it is important to maintain a neutral spine. What this means is having your spine in the most ideal position for you to stay well, strong and avoid injury. If we are not practicing good posture, or getting the care to help improve and maintain posture, we can become prone to injury, accelerated spinal degeneration and further health consequences. The image below depicts common postures we see as chiropractors. Everything shown right of the ‘Good Posture’ model reflects what we want to help people correct or even become aware of. If you are unsure if you have good posture, it is best to talk with your chiropractor or schedule an appointment for a spinal examination. Your body needs water to maintain soft tissue elasticity and the fluid in your joints. If you’re dehydrated, you have less fluid in the discs between your joints. A loss of space between vertebrae can cause a bulging disc or rupture. It also leaves you more vulnerable to injuries because of the loss of padding between the bones. Whether you lift weights, run or take a daily walk, exercise provides your spine and joints with the movement and stretching necessary to engage in whatever life throws your way. It also helps you maintain a proper weight and this places less pressure on your skeletal system. Stretching each day helps to maintain proper range-of-motion for your spine and joints. This ultimately reduces the risk of injury. Whether you’re picking up toys in the living room or lifting a heavy box, be aware of your body position. Bend at the knees and lift with your legs. Remember to keep the whatever you’re carrying as close to your body as possible. If you are a stomach-sleeper, it is best to kick that habit. Sleeping on your stomach puts stress on your back by over-flexing the lumbar spine (lower back). To help correct this, start out the night by sleeping on your side or your back, and if you wake up in the night, switch back to one of those positions. Placing a pillow between your knees while side-sleeping will help keep the twist out of your lower back and prevent you from rolling over. Do not ignore warning signs such as back pain or headaches. Your body sends out pain signals for a reason and these could be due to poor posture. The earlier you can catch an injury the easier it is to fix. You can download free app, so you can always be aware of your spine while on the go! Don’t forget to call us at 587-352-6611 for all your postural needs!